Courtesy of FlaLaw Online: U.S. District Court Judges Patricia Barksdale (JD 96), from left, Phillip Lammens (JD 02), Steven Merryday (JD 75); Appellate Court Judge Simone Marstiller (JD 96); U.S. District Court Judge James Moody (JD 72); and Appellate Court Judge Lori Rowe (JD 97) stand with 2014 Moot Court Final Four competitors John Van Hise (2L), Merrilyn Hoenemeyer (2L), alternate Warren Chin (2L), Julia Moffett (2L), and Jessica Kramer (2L). Students, faculty, alumni and distinguished guests filled every seat in the Martin H. Levin Advocacy Center for the 29th annual Zimmerman Kiser Sutcliffe Final Four Moot Court Competition held on Sept. 5. The onlookers watched four of the team’s top competitors present arguments regarding Fourth Amendment issues. John Van Hise (2L) and Merrilyn Hoenemeyer (2L) represented the petitioner, the United States. Julia Moffett (2L) and Jessica Kramer (year) represented the respondent, Andrew Hodor. Warren Chin (2L), alternate, acted as master of ceremonies and bailiff. A six-member panel of judges including Judge Steven Merryday, Judge James Moody, Judge Phillip Lammens, and Judge Patricia Barksdale (JD 96) of the United States District Court for the Middle District of Florida and Judges Simone Marstiller and Lori Rowe of Florida’s First District Court of Appeal heard the arguments. The arguments were displayed via video in Holland Hall as well as simulcast online. After an hour of intense oral argument in front of a hot bench, the judges announced the winners. Best oralist, best brief and best overall went to Jessica Kramer and best team went to Julia Moffett and Jessica Kramer. First-year students who are curious about the Florida Moot Court Team are encouraged to attend the information sessions that will be held this spring. 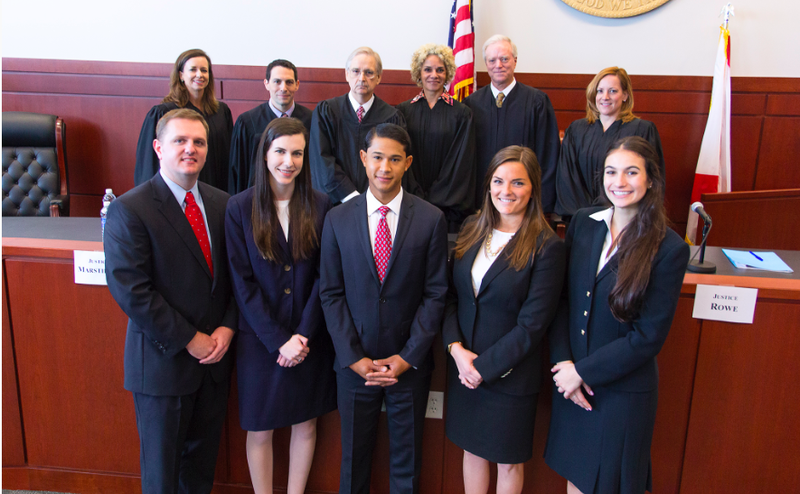 Every summer, rising second-year law students have the opportunity to try out to become members of the Florida Moot Court Team. The top five competitors move on to the Zimmerman Kiser Sutcliffe Final Four Moot Court Competition. Two competitors argue for the petitioner, two argue for the respondent, and one serves as an alternate and bailiff. All five students will receive scholarships funded by the Justice Campbell Thornal Endowment for outstanding performances in the summer intramural tryouts. Additional scholarships are awarded to the best oralist, best brief, and best team. The competition is sponsored by Zimmerman Kiser Sutcliffe, P.A., which is recognized as one of the largest law firms in central Florida. Zimmerman Kiser Sutcliffe, P.A., has been sponsoring the competition for 29 consecutive years. A replay of the competition is available at http://mediasite.video.ufl.edu/Mediasite/Play/7ba3b95c3ee1476fbf93da118321a85b1d.